vCenter Server delivers centralized management and proactive management for vSphere virtual infrastructure. VMware vCenter Server provides centralized management of vSphere virtual infrastructure. IT administrators can ensure security and availability, simplify day-to-day tasks, and reduce the complexity of managing virtual infrastructure. How Does vCenter Server Work? vCenter Server provides centralized management of virtualized hosts and virtual machines from a single console. It gives administrators deep visibility into the configuration of the critical components of a virtual infrastructure—all from one place. With vCenter Server, virtual environments are easier to manage: a single administrator can manage hundreds of workloads, more than doubling typical productivity when managing physical infrastructure. As the vCenter Server Appliance is on Photon OS, there is no third-party dependency for patches and upgrades. Problem resolution times are cut dramatically with the inclusion of a complimentary license of Log Insight*. Consistently meeting business-critical application service-level agreements (SLAs) requires automated proactive management to maximize the capabilities of vSphere. 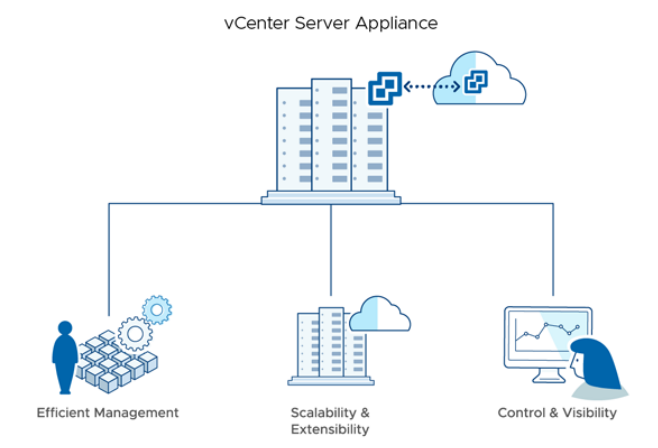 Key capabilities enabled by vCenter Server include VMware vSphere vMotion, VMware vSphere Distributed Resource Scheduler, VMware vSphere High Availability (HA) and VMware vSphere Fault Tolerance. VMware vRealize Orchestrator also gives administrators the ability to create and easily implement best-practice workflows. With automated proactive management, vCenter Server allows service levels to be met by dynamically provisioning new services, balancing resources and automating high availability. The open plug-in architecture of vCenter Server supports a broad range of additional capabilities from VMware and its partners. Hundreds of VMware partners integrate with vCenter Server, enabling new capabilities such as capacity management, compliance management, business continuity and storage monitoring. The vCenter Server APIs also allow integration of physical and virtual management tools for maximum flexibility. VMware vCenter Hybrid Linked Mode allows extensibility across the on premises data center and a vSphere based public cloud. Administrators now have a single pane of glass for management and visibility across their hybrid cloud environment. How Is vCenter Server Used? Enterprises face ever-increasing pressure to deliver IT infrastructure at the lowest total costs while consistently meeting SLAs. By using centralized and proactive management of virtual infrastructure, enterprises can ensure that IT consistently meets the needs of business. vSphere is the industry-leading virtualization platform. It enables users to run business-critical applications with confidence and respond to business requirements faster, while operating at the lowest cost possible. HTML 5 Based vSphere Client – Responsive HTML5 based vSphere client provides bleeding edge functionality. vCenter Single Sign-on – Simplify administration by allowing users to log in once and then access all instances of vCenter Server without further authentication. Inventory Search – Have the entire vCenter Server inventory, including virtual machines, hosts, datastores and networks, at your fingertips. Alerts and Notifications – Support new entities, metrics and events such as datastore and virtual machine–specific alarms. These alarms can trigger new automated workflows to remedy and preempt problems. Native Backup and Restore – Out-of-the-box file based backup option with a simple user interface, removing reliance on third-party backup solutions to protect vCenter Servers and Platform Services Controllers. Backup & Restore Scheduler – Schedule vCenter Server Appliance backups and control the number of backups retained. Use REST APIs to ease complexity of backup and restore. Migration Tool – Allows both migration of data from a Windows vCenter Server 5.5 or 6.0 and an upgrade of vCenter Server Appliance. vCenter Server High Availability – Protect the vCenter Server Appliance and related services with native High Availability and RTO of less than 10 minutes. VMware vCenter Server Converge Tool – Migrate topology from vCenter Server Appliance with External PSC into vCenter Server Appliance with Embedded PSC with ease. Host Profiles – Standardize and simplify how you configure and manage VMware ESXi host configurations. Capture the blueprint of a known, validated configuration—including networking, storage and security settings— and deploy it to many hosts, simplifying setup. Host profile policies can also monitor compliance. Resource Management for Virtual Machines – Allocate processor and memory resources to virtual machines running on the same physical servers. Establish minimum, maximum and proportional resource shares for CPU, memory, disk and network bandwidth. Modify allocations while virtual machines are running. Enable applications to dynamically acquire more resources to accommodate peak performance. Dynamic Resource Allocation – vCenter Server continuously monitors utilization across resource pools and intelligently allocates available resources among virtual machines according to predefined rules that reflect business needs and changing priorities. The result is a self-managing, highly optimized and efficient IT environment with built-in load balancing. Cross-vCenter Mixed Version Provisioning – Enable cross-vCenter provisioning operations such as vMotion, Full Clone and cold migrate, across different vCenter versions. Ideal for hybrid cloud solutions. Automatic Restart of Virtual Machines with VMware vSphere HA – Automatically restart virtual machines that have failed without manual intervention. Audit Trails – Maintain records of significant configuration changes and export reports for event tracking. Unified Patch and Upgrade Management – Using the capabilities of VMware vSphere Update Manager, enforce compliance to patch standards through automated scanning and patching of online ESXi hosts. With the integration of the vSphere Update Manager into the vCenter Server Appliance, deployment and configuration is a snap. Appliance Management Interface – Simple user interface that shows network and database statistics, disk space, and health in addition to CPU and memory statistics for monitoring and operational tasks. vRealize Orchestrator (included) – Simplify management by automating more than 800 tasks using out-of-the-box workflows or by assembling workflows using an easy drag-and-drop interface. vRealize Log Insight for vCenter Server (light version included) – Solve problems faster with added visibility from Log Insight. Visualize event trends, trigger alerts and more, all in real time* . Linked Mode – vCenter Server provides scalable architecture and visibility across multiple vCenter Server instances, with roles, permissions and licenses replicated across the infrastructure. You can log in, view and search the inventories of all vCenter Servers simultaneously. Enhanced Linked Mode with Embedded PSC – Simplify the vCenter Server topology through vCenter with embedded platform services controller. Link multiple vCenters and have seamless visibility across the environment without the need for an external platform services controller or load balancers. Hybrid Linked Mode – Enjoy unified visibility and manageability across an on-premises vSphere environment running on one version of vCenter Server Appliance and a vSphere-based public cloud environment, such as VMware Cloud on AWS, running on a different version. APIs – Integration with ecosystem partners extends capabilities of the virtual infrastructure. New APIs enable deployment of vCenter Server based on a template. VMware vCenter Server provides unified management for vSphere environments and is a required component of a complete VMware vSphere deployment. One instance of vCenter Server is required to centrally manage virtual machines and their hosts and to enable all vSphere features. SnS is required for at least one year. Powerful management tools for smaller vSphere environments looking to rapidly provision, monitor, and control virtual machines. Large-scale management of VMware vSphere deployments for rapid provisioning, monitoring, orchestration, and control of virtual machines. 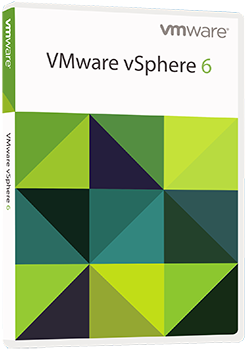 Download the VMware vCenter Server Datasheet (PDF).